QRP advocate Bill Minikiewicz, of Breadboard Radio, will present a talk on QRP at this years Shelby Hamfest. Although the presentation will focus on the why and how of QRP operation designed to get hams excited about low power operating there will also be time for discussion about your experiences as QRPer’s. Hopefully, this will turn into an annual QRP get together for the Southeast QRP gang. Several Breadboard Radio Kits will be given away, so be sure to attend. Also look for W4FSV operating QRP pedestrian in the Tail Gate area! The Shelby Hamfest will be September 1, 2 and 3, 2017 at the Cleveland County Fairground, Shelby, NC. Bill’s talk is at 12 noon. Check out www.shelbyhamfest.com. Excellent, Bill! Though I’m hosting a table in the flea market at Shelby this year, I will certainly plan to attend your QRP session! 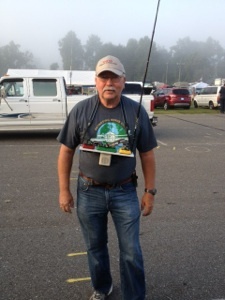 This entry was posted in Events and tagged Bill W4FSV, Breadboard Radio, QRP, Shelby Hamfest. Bookmark the permalink.